Normal practice when handling ancient artifacts is to move carefully and minimize any sudden movements. Shaking the object is definitely not encouraged. 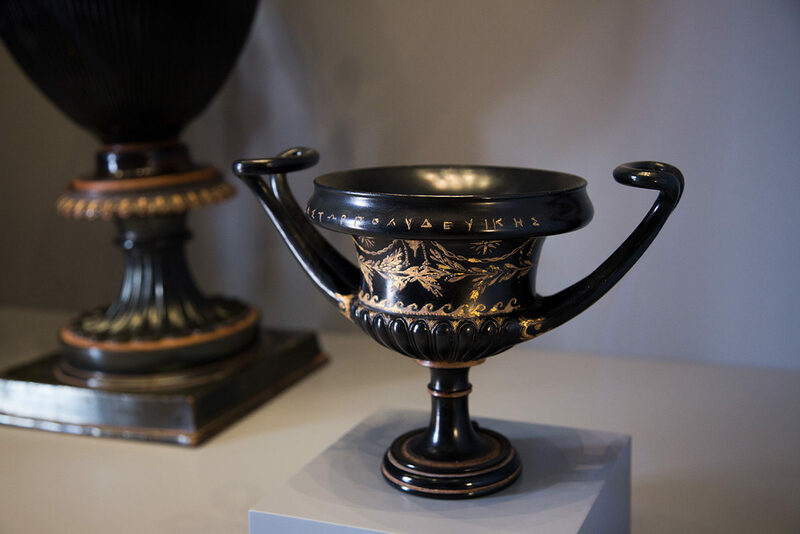 But that’s exactly what we—a group of museum curators and conservators—did when this exquisite Greek black-glazed kantharos (wine cup) was temporarily removed from display during the reinstallation of the Getty Museum’s antiquities collection at the Getty Villa. One of just a handful of “rattling cups” that survive from the fifth and fourth centuries B.C., we wanted to learn more about how it was made. (1) Although we were eager to find out what was below the surface of the cup, we started by examining its exterior. 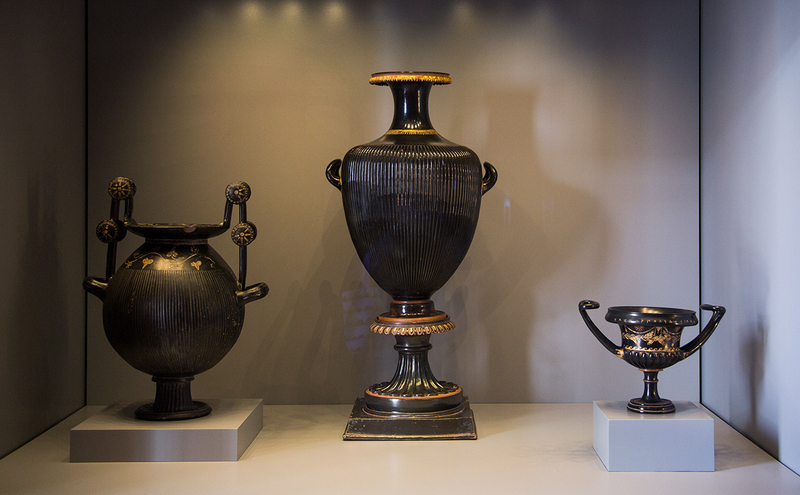 The kantharos’s distinctive shape, with profiled lip, tall foot, and elegant, upward-sweeping handles, is characteristic of black-glazed pottery made in the second half of the fourth century B.C., and replicates the form of luxury vessels in metal. Although the cup is currently catalogued as South Italian, the shape—and its striking decoration—are also typical of Athenian manufacture, and it may in fact have been produced there. (2) During the fourth century B.C., Athenian pottery was both imported into southern Italy and imitated by local craftsmen. The best South Italian versions were meant to be difficult to distinguish from Athenian examples, and we are continuing to investigate where ours may have been made. A Greek inscription applied in gilt around the rim reads: ΚΑΣΤΟΡΠΟΛΥΔΕΥΙΚΕΣ (“KASTORPOLYDEUIKES”). Kastor and Polydeukes were twin sons of Zeus—known together as the Dioskouroi—and were worshipped as protectors of sailors, horsemen, and chariot racing. (3) The inscription indicates that the kantharos was dedicated to them, perhaps as thanks for—or in hope of—safe passage at sea or a successful race. The gold decoration supports this idea: because each brother split his time between Mt. Olympus and Hades, they were often represented by stars, depicted here beneath the cup’s rim. Further, the wreath, garlands, and bucrania (skulls of sacrificial bulls) decorating the cup’s body all evoke religious ritual. Although a common decorative motif in ancient Greek art, the band of running waves must also have reminded viewers of the gods’ special role as saviors of seafarers. The gilding and exceptional quality of the kantharos on their own would have made it a suitably impressive gift for the twin gods, but while examining the cup we found something else that would have made it even more valuable. Underside of the foot of the rattling kantharos. 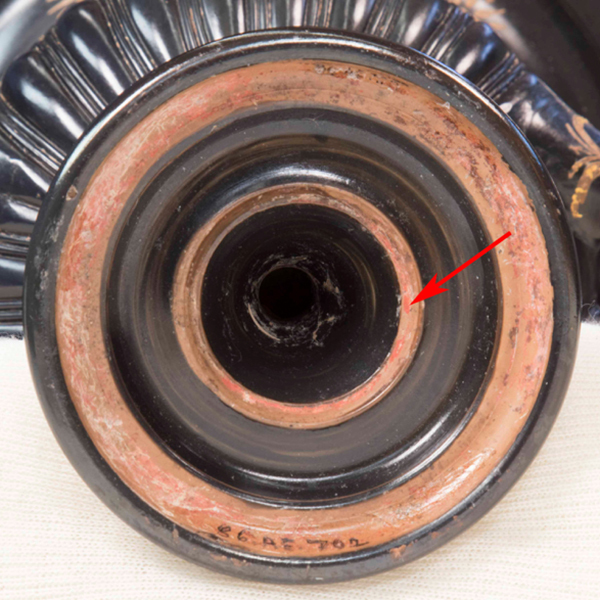 The arrow shows a trace of cinnabar pigment, which appears redder than the ceramic body. The underside of the vase’s foot is decorated with alternately glazed and unglazed rings. Looking closely we noticed that the unglazed rings in fact showed small traces of red paint that indicate they had been colored. Using Raman spectroscopy, a technique that can identify specific molecular structures, we discovered that the pigment was cinnabar (mercury sulphide). Lifting and swirling the cup as if drinking or making a libation (liquid offering) during a ceremony produces a rattling noise. We could assume the sound was made by loose pellets moving inside the rim, but wanted to look below the surface to find out how it was constructed. Taking the cup into the conservation labs, we did what we are normally taught never to do: we gently swirled the cup around, like a wine glass. We recorded the sound, which raised several questions. We had at first thought there were two pellets, but we actually heard what sounded like a single ball rolling inside the rim more frequently than two simultaneously. We also wondered: Could the entire vessel be double-walled, or were the pellets moving in an isolated channel? How would a potter have made such an intricate mechanism? To better understand the cup’s construction, we relocated to the X-radiography suite. Similar to a medical X-ray, this technique helps us observe details within an object and answer questions about construction methods as well as condition. The X-radiographs revealed a number of interesting features. We confirmed that there are indeed two small balls that roll along a channel in the vessel’s rim. The images also show that the balls are slightly denser than the surrounding ceramic, although the specific material is still unknown. We thought that they might be made of metal, so we tested this idea with a handheld metal detector. The pellets were not detected, meaning they could be made of heavily corroded metal or another material entirely. X-radiograph of the rattling kantharos. The ball on the right is caught in the small niche in the channel of the rim. The X-radiograph also revealed that the rest of the cup is single-walled. We think that one way the potter might have achieved the construction of the cup is by raising the upper edge of the cup and folding it over to create a hollow space. The clay would be stretched thin by this process, which would reduce the need for ventilation holes that typically prevent pressure from trapped air. As for why it sometimes sounded like there was one ball in the rim and sometimes two, the X-radiograph revealed that one of the balls was resting in a small niche. It remained caught until it was knocked loose by the other pellet, explaining why we frequently only heard the sound of one ball. Noticing the small niche in the X-radiographs led us to examine the exterior of the rim more closely. We found a small, barely perceptible, raised circle in the rim where the potter likely inserted the pellets and then plugged the hole. The technique was expertly concealed even under magnification. In the thin, curved handles, we noticed several metal pins—evidence of a previous restoration. This technique was intended to improve stability in broken areas, and used to be common in ceramic restoration. The restorations are still stable and hardly visible during visual examination. 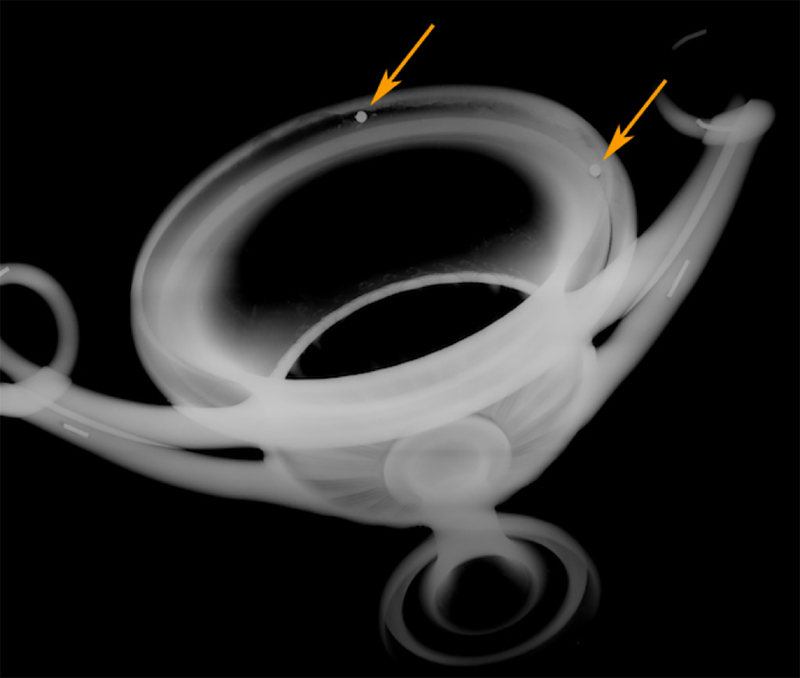 Some of the gilded elements of the cup also showed up in the X-rays since the gold is denser than the ceramic body. Under magnification, we can see that the artist made rough incisions to mark the gilded areas before applying the precious material. 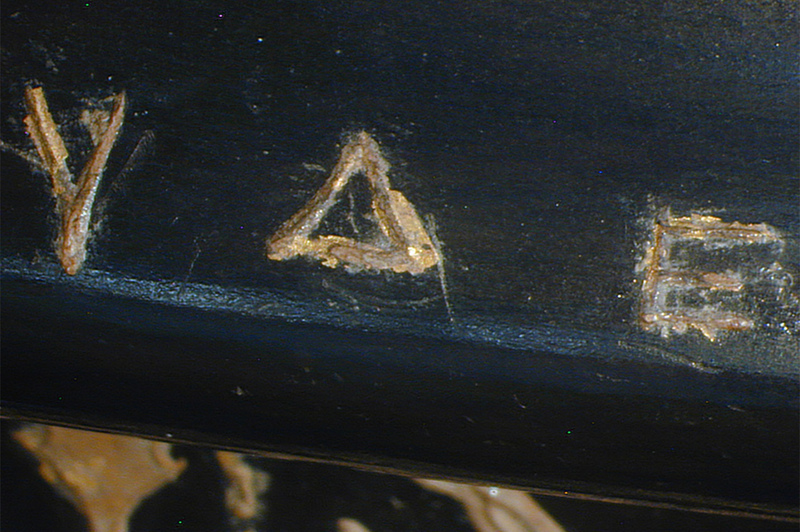 Detail of the rattling kantharos’s gilded inscription at 100x magnification, showing that the potter sketched the letters before gilding them. Noting the care taken with the gilding, it is interesting that Polydeukes’s name contains an error. Whoever incised the inscription in the clay made a mistake with the spacing of the letters, starting the vertical stroke of the kappa (“K”) too close to the upsilon (“U”). Correcting the mistake left what looks like an iota (“I”) between the two letters, but we can assume that he never intended the mark to be gilded and made visible. The fact that it was suggests that the gilding may have been done by a different craftsman, perhaps someone unfamiliar with the name (or simply not paying attention!). This gives intriguing insight into possible workshop practices, and the number of artisans that may have been involved in the production of a single object. Why Make a Cup Rattle? It is clear from its complex construction and elaborate decoration that this cup was expensive and valuable. But why make a rattling cup in the first place? If the kantharos was used by ancient Greeks during a symposium (drinking party), it is possible the rattling was intended to trick an unknowing handler into thinking they had broken it—quite a mistake given the cup’s obvious cost! This explanation could mean that the niche inside the channel in the rim may have been intentional, perhaps designed to extend the joke. 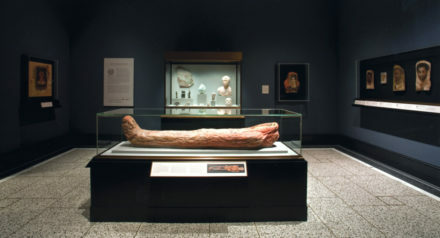 The rattle may also have had something to do with the inscription to the Dioskouroi. The fourth-century B.C. poet Eubulus mentions a glossy, black “pebble-rattling” cup (ψηφοπεριβομβήτριαν or “psephoperibombetrian” in Greek) used as part of a libation ceremony that took place at the end of a meal before a symposium began, in which wine was offered to Zeus Soter (Zeus the Savior). (5) Ritual events in antiquity were often accompanied by the sound of rattles, cymbals, and tambourines, which were thought to have magical and protective properties. At the same time, the novelty of a rattling cup may have been intended to entertain the god. Although we can’t rattle the kantharos anymore—it is now back on display on the ground floor of the Getty Villa, in the Temple of Hercules (Gallery 108A)—we like to imagine it being used in such a ceremony, delighting the Dioskouroi and encouraging them to look kindly on the cup’s dedicator. The rattling kantharos in its display case in the Temple of Hercules. 1. For discussion of rattling cups more broadly, see Michael Vickers, “A Note on a Rattling Attic Black Glaze Cup in Dublin,” The Journal of Hellenistic Studies 90 (1970): 199-201; “An Ex-Rattling Cup in Oxford,” American Journal of Archaeology 77, 2 (1973): 196-197; and Michael Vickers and L. H. Jeffrey, “Two More Rattling Cups,” American Journal of Archaeology 78, 4 (1974): 429-431. 2. Nina Zimmermann, Beziehungen zwischen Ton- und Metallgefässen spätklassischer und frühhellenistischer Zeit (Rahden/Westf. : M. Leidorf, 1998), 19, pl. 10, no. KT 24 (RT 10, VE 26). 3. Archaic hymns to the gods describe sailors climbing to the tallest part of the ship during stormy weather to invoke the twins’ protection (Hymn Hom. Dios. 6-17). For discussion of the Dioskouroi in art and myth, see Henry J. Walker, The Twin Horse Gods: the Dioskouroi in the Mythologies of the Ancient World (London and New York: I. B. Tauris, 2015). 4. Dyfri Williams, “Gilded Pottery and Golden Jewellery,” in The Macedonians in Athens, 322-229 B.C. Proceedings of an International Conference held at the University of Athens, May 24-26, 2001, eds. Olga Palagia and Stephen V. Tracy (Oxford: Oxbow Books, 2003), 228-229. 5. The fragment is preserved in a later third-century A.D. text by Athenaeus of Naukratis (Deipnosophistae 11.471d). 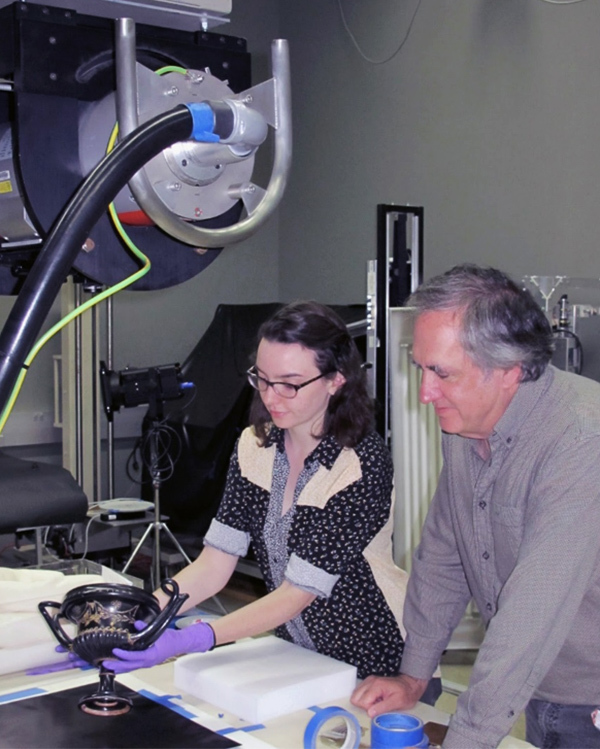 I'm a graduate intern in Antiquities Conservation. Thank you so much for sharing this and especially for posting the sound recording of the rattling! What a delightful addition to the experience of seeing this piece and learning about it. 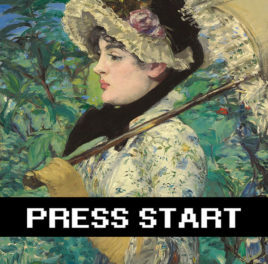 One more incentive to go see the reinstalled galleries! 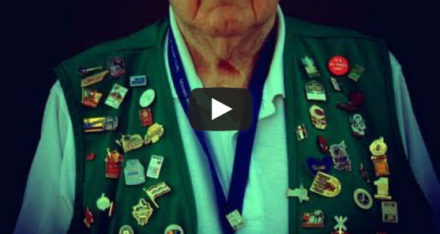 Thank you for sharing this information and sound byte. I am looking forward to my next visit. Loved the sound byte! Thanks for sharing.